By the time I came to The Kingdom of Perfumistas, Queen Shalimar had an acclaimed flanker, which was widely praised and subsequently discontinued. This modernized version was known variously as “Shalimar Light,” or “Shalimar Eau Legere Parfumee.” Even more confusing is the fact that the version concocted by Mathilde Laurent was later tweaked by Jean-Paul Gaultier, after Ms. Laurent had a falling-out with her boss and went to work for Cartier. 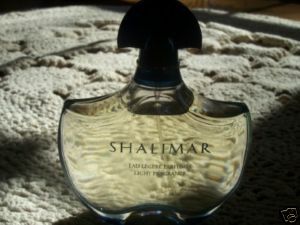 Shalimar Eau Legere, composed by Mathilde Laurent, was a pale straw-colored liquid, presented in a pale blue bottle with dark blue lettering that brought that distinctive Shalimar bottle to mind, pictured at left. The sprayer mechanism was located in the fluted ventaille top, which does not come off. This is the version that most perfume-lovers call the better iteration. It’s nearly impossible to find these days. The second version is generally known as Shalimar Light, although all bottles of SL/SEP bear the same two descriptions (Shalimar Eau Legere Parfumee/Light Fragrance). The second version, with notes similar to the first, is light blue liquid in a clear bottle with gold lettering. This bottle has a removable cap, with spray mechanism underneath. This version is slightly easier to find, although it’s getting scarce too. I have a photo of the two bottles side by side, but am experiencing camera problems at the moment. I’ll post the photo when I can. As for the Jean-Paul Guerlain version of Shalimar Light, pictured at right, it’s subtly different. The first five minutes are strongly reminiscent not of bergamot, but of lemon oil furniture polish, intense and inedible. I love the smell of lemon oil, but I’m not enthused about smelling like the maid, so I turn my attention elsewhere for the first five minutes. * After that the strength of the bitter lemon note softens and becomes very enjoyable. This citrusy facet seems to stick around longer than it does in SEL, and is still faintly apparent in the drydown. The florals are less apparent in this version; I do smell jasmine and ylang, but this iteration of Shalimar Light seems more focused on the citrus and vanilla, without the floral focus the first version seems to have. The drydown is far less smoky, but the vanilla is smooth and unsweetened, and augmented by the rich creaminess that tonka bean and benzoin provide. This one is pretty much lemon-vanilla-tonka all the way, delicately garnished with a single jasmine flower. It’s somewhat less complex than the Laurent version, and bears less of a resemblance to classic Shalimar. I think the first Eau Legere, the Mathilde Laurent composition, is a better fragrance. It’s as detailed as tapestry; it takes the wearer on a scent journey; it keeps surprising with things one might not expect (the 3D florals, the herbs, the smokiness). BUT. (You knew this was coming, didn’t you?) I actually prefer Shalimar Light, the version tweaked by Jean-Paul Gaultier, or as I like to call it, SL 2.0. I think there are a couple of reasons informing my preference. One, I smelled the blue juice first, and liked it. I didn’t compare it to anything, I just enjoyed it, unburdened by any idea of trying to identify which I liked better. Two, SL 2.0 has become a comfort scent for me in all seasons except summer, when I find it too heavy. It’s one of those wonderful perfumes that just plain smells nice; I don’t have to think about it, or process it emotionally – I just put it on and feel like myself. Three (and Three is actually related to Two), it reminds me somewhat of My Darling Emeraude in feel. It’s a “me” scent. Shalimar Light shares that velvety benzoin-tonka-vanilla base with Emeraude, and with Mariella Burani, another one I feel very comfortable in. Notes are quite similar to Shalimar (well, duh), but the basenotes have been pared down considerably – no vetiver, no leather, no sandalwood, no civet, no patchouli. No musk is listed, but Shalimar Light can smell fairly “dirty” on me at times, and I think there’s some musk in there. 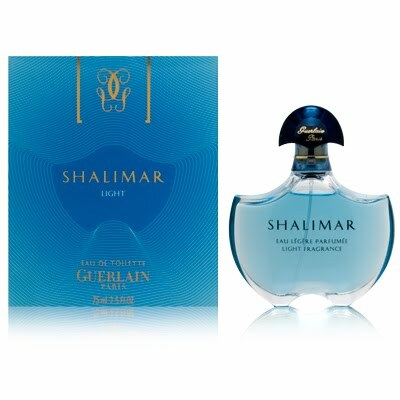 If you went and checked out the Perfume Shrine post, you probably read that comment from Guerlain’s PR rep stating that Eau de Shalimar is the same as the Jean-Paul Guerlain version of Shalimar Light. I’d disagree. I tested a sample vial, and assuming it’s representative, Guerlain has thinned down the Blue Juice even further. The opening smells like lemon baby wipes, not even as assertive as the lemon oil furniture polish in Shalimar Light v. 2.0. The florals are thinner, and the base smells more straight-up vanilla than that creamy, deep benzoin-tonka-vanilla thing that I love. This one’s all watered-down lemon cream soda, too sweet and thin to be worth something. There’s a good reason it’s clear liquid in clear glass, seems to me, and in my opinion, Eau de Shalimar is a mess to be avoided. Images are all from ebay and fragrantica.com. Like I said, I’ll try to post that one I took myself sometime soon. *And I AM the maid around here. Today I went to the US post office to claim a box sent via cutoms of what I thought was a bottle of the light (blue juice). It was beautifully wrapped and packed perfectly, but the bottle is clear as is the liquid. It looks similar to the Eau you show above except it has a white painted flower-like design in it. It all came with a small white silk flower on the necak of the bottle. I believe it came from AZ perfumes. Any idea what this is??? The box looks the same, but the floral design is silver and tells the story of the empoeror on the back. Why won’t Guerlain bring back the light? They would make a fortune. One and only bottle sits empty on my vanity. I am constanly searching for another. Thought I was getting it today. Instead I have a mystery scent! Hi, A&A! Sorry your bottle wasn’t what you were expecting – I do know that either version of Shalimar Light/Eau Legere is getting really hard to find even at the discounters at this point. Does your bottle look like this? I just did a quick search for Shalimar Light or Shalimar Eau Legere Parfumee online, and I can’t find anywhere that *actually* has the perfume in stock – just the shower gel. There are several “teaser” listings, but when I try to place the item in my cart, I’m told it’s out of stock. Your best bet at this point might be ebay… nope, just checked there and there’s only one listing, a set with lotion, shower gel and a small 1oz bottle of fragrance, $120. (ouch.) Oh dear, I think it may be really gone. I know, I know – SHAME on Guerlain for discontinuing it. SHAME SHAME! Helg at Perfume Shrine has a nice long informative post on Shalimar Light (link up there in the article), but she says Eau de Shalimar is the same as the 2nd version (blue juice) according to Guerlain. I think she cannot have actually smelled EdS herself, though – they’re not at all the same to me. 86, yes the link you provided shows is exactly what I received. I ordered it through amazon via AZ perfume. My order total was $82.22. I agree it smells nothing like the light! I am not sure if I care for the scent at all, but will likely hang onto to it for the beautiful bottle. But, at least this will assist another from being lured by false advertising!!! Thanks so much for the response and information!